This Smart Bulb is a standard E27 Edison fitting but features built-in Wi-Fi so you can control the colour and brightness of the lighting using your mobile phone or tablet via a mobile app which can also manage multiple other LIFX bulbs around your home. Once the LIFX WiFi Smart Bulb is fitted, you can remotely control your lighting by connecting to the cloud, so can switch on lights ready for you getting home, or if you realise that you have forgotten to switch them off before leaving then you can switch them off anytime, anywhere. Lights can be controlled individually or grouped together if you prefer, plus with up to 16 million colours via the colour wheel control, you can subdue or intensify any room with the perfect ambient lighting for your mood. You can also create lighting schedules and programmes to fit your routine and have lights automatically dimming when you go to bed, or slowly increasing the light to wake you up naturally by simulating sunrise in the morning. The LIFX Color 1000 WiFi Bulb is also compatible with a wide variety of other smart services including the Samsung SmartThings and Nest smart systems. So the LIFX LED Smart Bulb can work in conjunction with motion sensors, cameras, thermostats and other smart devices. In addition to remote control and monitoring via your smartphone or tablet, the smart bulb is also compatible with the latest smart wearables such as the new Apple Watch or Android Wear. There is no central hub required, though the LIFX LED Smart Bulb will work with a smart hub as part of a home automation system. 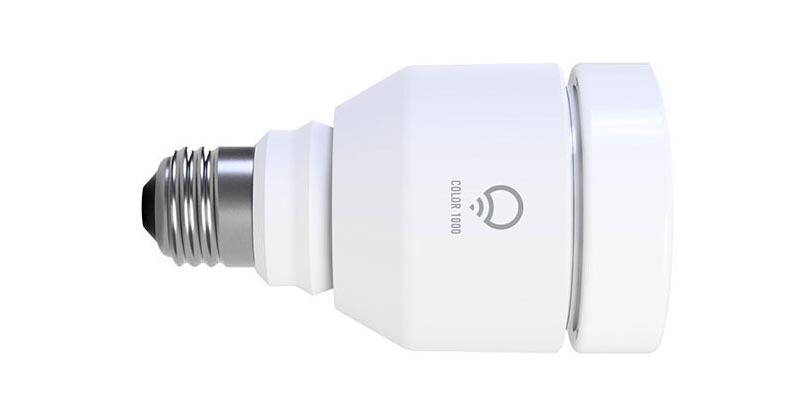 This WiFi controllable light bulb is compatible with Apple iOS 8 onwards and Android 4 onwards, the bulb itself is only slightly larger than a conventional bulb at 117 x 63 x 63mm and weighs just 240g.